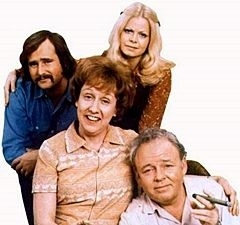 Based on the British comedy show “Till Death Us Do Part” this sitcom was simply about a blue collar worker whose narrow minded right wing political views on life were so counter to the prevailing opinions of the ’70s that it made for some hilarious comedic situations. 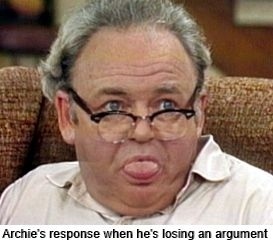 The family patriarch is Archie Bunker (Carroll O’Connor) a bigoted, sexist factory worker who had an opinion on mostly everything. Archie is not a bad person it’s just that his views haven’t progressed to modern thinking. 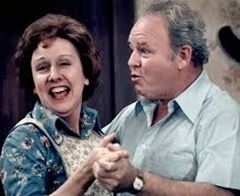 His wife Edith (Jean Stapleton) is a sweet understanding woman who usually yields to her husbands interpretations of the world until that is on the rare occasions when she doesn’t. When she decides to put her foot down then everybody listens. When she does speak up we get to see the real love that Archie has for her, as for the rest of the time he is usually telling her to be quite by saying “Edith stifle”. Gloria his daughter (Sally Struthers) marries, much to Archie’s chagrin, Michael Stivic (Rob Reiner) a left wing college student product of the 1960’s counterculture and at odds with Archie on every conceivable topic. 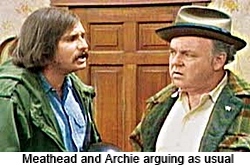 Archie’s favorite names for Stivic are Meathead and dumb Polack. The shows humor comes from Archie trying to deal with friends and family who live in a world that has changed while he still clings to his Hoover era values. To help fuel the comic situations Archie gets an African American family, the Jeffersons, as next door neighbors. George Jefferson (Sherman Hemsley) was just as pig headed and stubborn as Archie but with his own opinions. 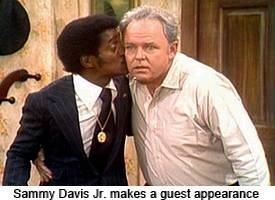 “The Jeffersons” becomes one of the many spin offs from All in the Family. (see chart below). During the run of the show The Bunkers also get an Italian family as neighbors and Mike and Gloria finally move out, only to move in next door. In the last season they adopt a little girl Stephanie (Danielle Brisebois) who is Edith’s Grandniece. Carroll O’Connor passed away in 2001 of a heart attack, he was 76 years old. Isabel Sanford died in 2004 of complications from a surgery, she was 86. Bea Arthur died in 2009 of cancer, she was 86. Betty Garrett passed away in 2011 of an aortic aneurysm, she was 91. Sherman Hemsley died of cancer in 2012, he was 74. Jean Stapleton sadly left us in 2013 she was 90. 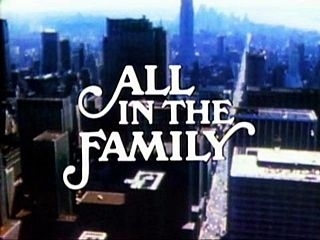 All in the Family’s huge success spawned several spin-offs.